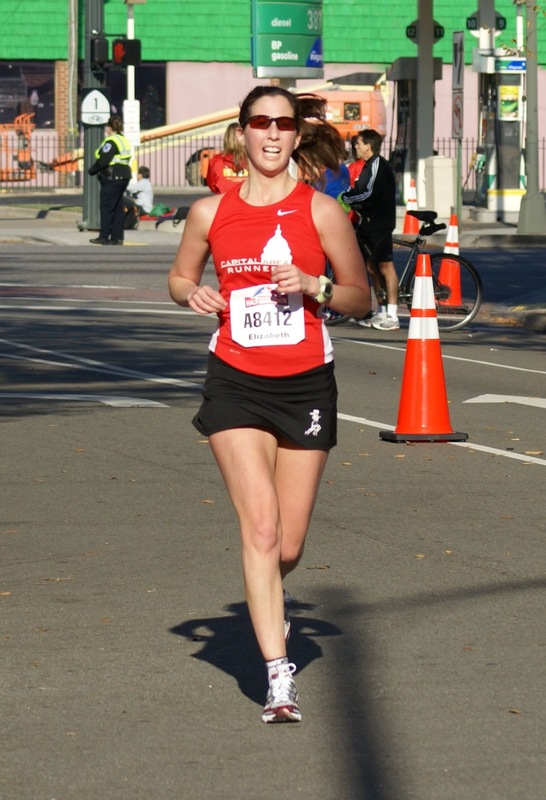 Racing Stripes: The Richmond Half Marathon - Goodbye 30's! 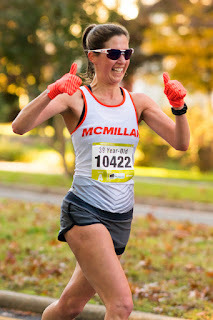 The Richmond Half Marathon - Goodbye 30's! I'll be honest, I had high hopes going into this race. 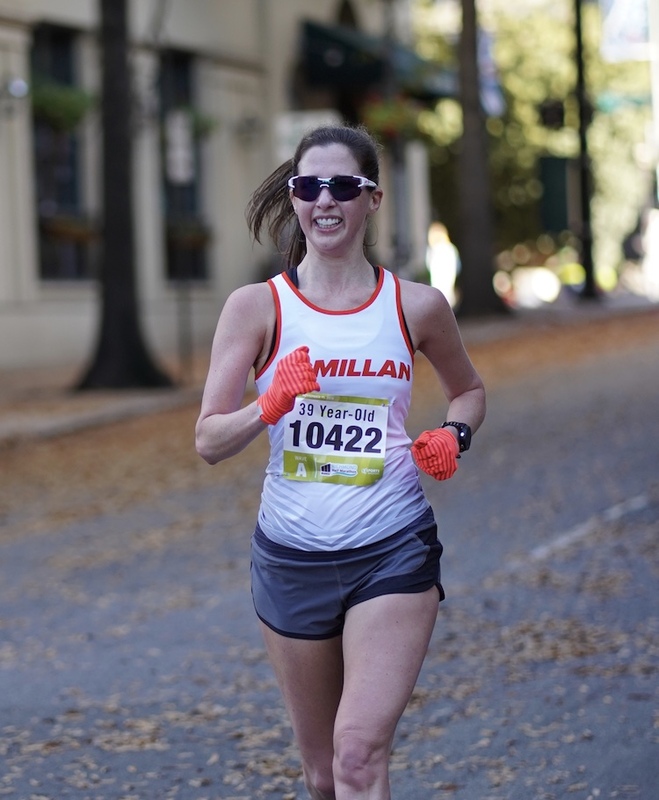 I truly believed myself to be in the best half-marathon shape I've ever been, and my recent workouts had been faster than those leading up to my PR half marathon in Houston last January. Even though I know anything can happen in a race, I was about 90% confident I'd set a PR. I hadn't set a PR in any distance since Houston in January and I knew I had come a long way with my fitness since then. I had run this race 3 times in the past: 2008, 2012, and 2015. My course PR was 1:35:08 from 2015. 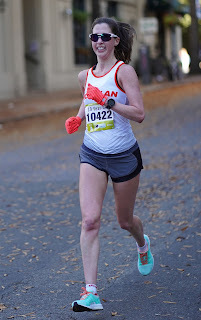 The Richmond Half Marathon was my last race in my 30's, before entering the Master's division. At 39 years and 364 days, I was the oldest non-master in the race. So I figured I might as well live up my last day in my 30's and have it on my bib. 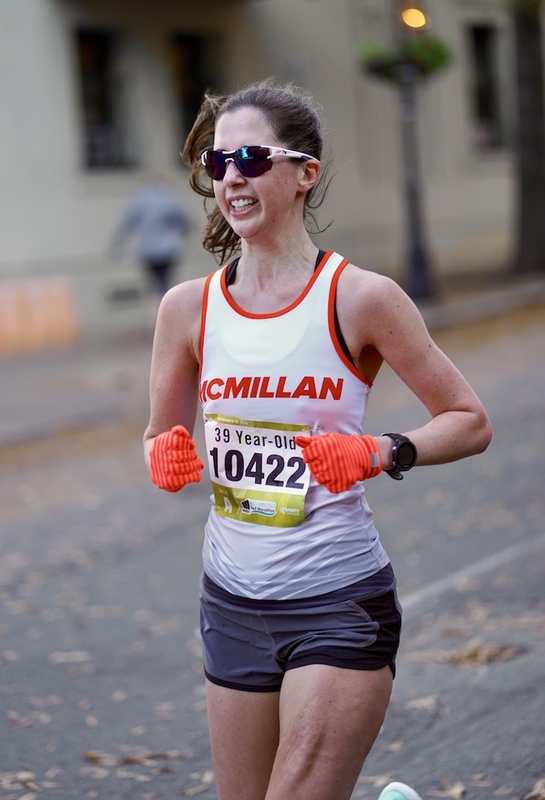 When I posted photos of myself and my bib on Instagram, many people thought that the race automatically put everyone's age front and center on their bibs! Ha! So let me clarify up front that the Richmond Marathon allows you to put whatever words you want on your bib. I'm training for the Rehoboth Beach marathon on December 8. 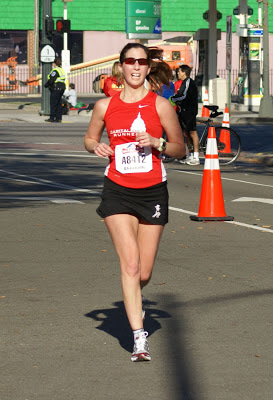 And even though this half marathon was technically a tune-up, I still tapered for it and raced it to my full ability. I didn't run extra miles before or after (except for one warm up mile). I didn't view it as a workout. I viewed it as a race that I was well trained and well tapered for. Maybe that was a mistake. I slept reasonably well the night before the race. I never sleep all that great in hotel rooms with a big race the next day, but I woke up feeling good. I ate my standard bagel + banana with peanut butter (more on this later) and had a serving of Generation UCAN 30 minutes before the race start. Our hotel was only one block away from the start line, so it couldn't have been any more convenient or easier. I ran one mile as a warm up and then I headed for the start line. I said goodbye to Greg, who then walked about a mile down the course to get photos of me. At the start line, I found two runners who I knew and we chatted a bit. It was 43 degrees and sunny with 10-14 mph winds. I could have done without the wind, of course, but otherwise these were pretty good conditions. My plan was to start at around 7:00 for the first three miles, and then speed up from there, ideally holding 6:55 for the rest of the race. I had run several workouts in recent weeks that made me confident in this approach. I knew ahead of time that these miles would be uphill and into a headwind. The headwind didn't seem too bad, and nor did the hill. I stuck to my plan of running a 7:00 pace (it was just slightly slower) and everything felt really good, as it tends to feel during the first three miles of a half marathon. I saw Greg just before the first mile-marker, as well as my former coach. I tried to stay behind groups of runners to be protected from the wind. I had no idea where the 1:30 pacer was. I was trying to run slightly slower than 1:30, and I know those pacers try to run slightly faster than their target so I wasn't trying to run with that group. I simply wondered where they were. They were near me at the start line and I never saw them during the first three miles, so I figured they must be behind me and starting really conservatively. three miles, and she looked strong, so I was happy to keep her in my sights during these miles. She was wearing warm armers, a singlet, and loose shorts. Why do I note this? For some reason, it seems that in every race in which I don't do well, I start out following a woman wearing this exact outfit. And then she runs ahead and I fall back. I remembered this and vowed that I would stay with her and not fall behind. I saw my friends Allison and Cheryl somewhere around mile marker 5, just as we entered the park. I ran this race in 2015, and I remembered the park well. It was the most challenging part of the course: hilly, and with very uneven pavement. You had to watch your footing and it was a constant up-and-down. However, I fared really well in 2015, and the park didn't slow me down that much at all. And I was able to speed up after it. Yesterday was a different story. The hills felt harder than they should have. I lacked the energy to run up them at my normal pace, so I slowed down a little and tried to make up for it by running the down hills hard. I hit the 10K timing mat at 43:41, and I had planned to hit it at 43:20, so I was a little off. I didn't let it bother me and I told myself I would speed back up again once I was out of the park. The final two hills before exiting the park were brutal. I slowed down a lot running over them, and the group I was with started to get ahead of me, including that one woman. This was very demoralizing but I told myself I would get my energy back and catch up soon enough. That didn't happen. I was relieved to be back on the roads with nice, even pavement but the energy was gone. I couldn't hold my pace any longer and I started to feel really bad. There was no one thing in particular that hurt, but I was struggling big time. At that point, I knew a PR wasn't going to be likely so I started to focus on trying to run a course PR, which would be sub-1:35:08. I knew I would be really disappointed if I couldn't even do that. I remembered how I felt at RNR New Orleans back in March when I bonked because of the heat. That started at around mile 5, but I didn't stop and I stayed in the 7:30s for the rest or the race. I was in the 7:20s now so, at least my "bonk" pace was faster. I was trying to think of ANY possible thing that would keep me positive about this race. I refused to allow myself to get upset or discouraged. I knew that the last three miles of this course would offer a tail wind and a net downhill. This thought perked me up a little and I was able to speed back up to around 7:05 for a short while. Lots of people had been passing me and I decided to set a new goal of not letting anyone pass me. I looked down at my Garmin and my average race pace was 7:11, so if I ran faster than that, then people shouldn't pass me unless they were running a negative split. Which of course, many people do, but the majority do not. That burst of energy was short lived and I was back to just hanging on again. Now my motivation was simply to get to Greg at mile 12.5. I didn't want him worrying about me. At some point around mile 10 or 11, the 1:35 pacer passed me. I realized that the 1:30 pacer must have been way ahead of me the whole time, and probably went out so fast I never even saw them at the beginning. Having the 1:35 pacer pass me was no fun, but I told myself he was probably going to over-achieve, and I could still get a course PR even if he passed me. I saw my previous coach again who gave me words of encouragement and finally I saw Greg, just before turning onto the final downhill stretch. I rallied hard at the end, and wanted to take full advantage of that long downhill finish. needed to. And I typically don't need any fuel during a half marathon if I take a full serving of UCAN right before. I felt super nauseous and like I just needed to get something out of my system that wasn't even there. Greg and I re-united and walked a back to our hotel. I wasn't nearly as upset as I was after the 10-miler from four weeks prior. In fact, I wasn't really that upset at all. I was just happy to be done with it. My official time was 1:34:29, which is about two minutes slower than my PR from Houston, and 40 seconds faster than my course PR from 2015. It's a very respectable time and I was elated when I ran that 1:35 three years ago. So, to "bonk" and beat that time isn't too bad. Even my coach said that to have 1:34 be a disappointment means I'm really fit. 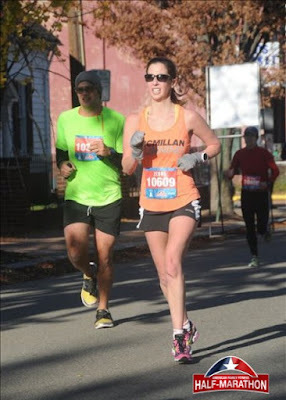 He encouraged me to shake this off quickly and just focus on the upcoming workouts and the Rehoboth Beach Marathon in four weeks. I could have stewed in disappointment, but instead I focused on my birthday and turning 40, and I vowed that I would set PRs at all distances in my 40s. So, what went wrong here? Why did I under-perform? I have three main theories. 1. I went out too fast. Rookie mistake, but I think I under-estimated the effect of the wind and the uphill nature of the first 3 miles. If the course were flat and there had been no wind, THEN I would have wanted to start at a pace of 7:00. So, in hindsight, I think I was exerting way too much effort during those early miles, possibly the equivalent of a 6:50. I didn't want to use the wind as an excuse not to push hard, but you're not supposed to be pushing hard in the first three miles of a half marathon. Due to the dry heaving and the vomiting after my last half marathon in New Orleans, I suspect there is something going on with my digestive system. Since I started running marathons and half marathons I have always eaten a bagel with peanut butter and a banana exact two hours before the race start. And then been able to go to the bathroom afterwards, emptying my stomach. But, I never eat anything before my training runs. Even the long runs-- I just take some UCAN. And my training runs almost always go really well. So, I think that for the marathon I will eat half a bagel instead of a full bagel (I did that for Boston because that's all I was hungry for), and less peanut butter. I'll be sure to eat plenty the day before and continue to have my UCAN before the race. 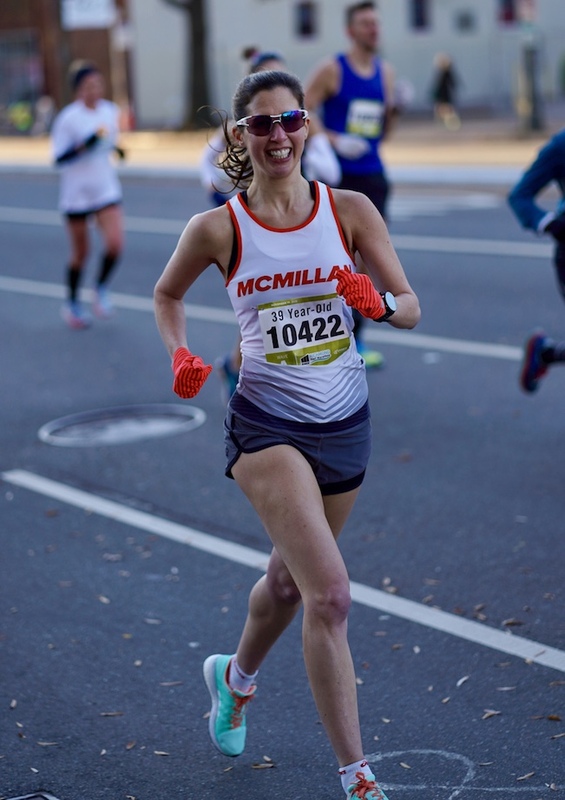 My suspicion is that my body is still working to digest all that food during the race (even though I ate it two hours prior) and that process is sapping energy from my running. Just a theory! When I looked at my training schedule, I actually thought my coach had given me too MUCH of a taper. Just 50 minutes easy on Wednesday, 40 minutes easy on Thursday, and 20 minutes easy on Friday. I felt like I didn't need to back off that much to be rested for a half. But then my friend Lisa pointed out that I had run 76 miles the previous week, and 68 the week before. I ran 10 miles on Tuesday. I was "in the thick" of marathon training, so to be fully rested I would have needed even more of a taper. I didn't think my legs were the limiting factor, rather my energy level, but a taper takes care of both of those things. Regardless, I wouldn't have wanted more of a taper because that would have impacted my marathon training cycle, which is already very short. I still believe (as does much coach) that I am in very good shape and capable of running 1:30. But one of these factors, or some combination, likely contributed to me not being able to perform yesterday. The zebras are reading Boston Bound. Greg surprised me with this cake! Happy Birthday and Happy New AG! What a great cake! Congrats on your hard fought course PR! 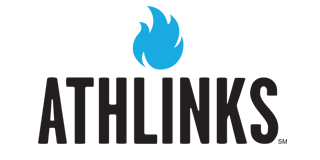 I'm always amazed that just when I think I have my fueling all figured out, I have issues and have to figure it out all over again. I love your mental toughness and your perseverence, even when you didn't feel well! ZEBRA Cake!!! Given the dry heaving afterwards, it's very understandable why you were a few minutes off. Think about how awesome you did. Mother nature wasn't with you and was trying to make your last race before being a Master's runner awful and you said NO WAY I'm getting this course PR!! Greg really outdid himself on the cake - so thoughtful and detailed. I'm similar to you in that I don't eat before workouts, but do eat before some races. It can be tricky to make that switch. Typically, I only eat before marathons, but before the recent Jazz half marathon I ate a very small amount of oatmeal - 1/3 C at most - because we were arriving early and running a 3-mile warmup. I wanted to have fuel left in my system for the race. But I did question that decision, since having food in your stomach when you aren't used to it can spell disaster! Luckily it was fine, and I never even thought about my stomach, but a larger portion could have been problematic. It's still something I'm trying to figure out, honestly. Nice cake! Love the detailed race report, too! What went wrong? Nothing...you ran a fine race to the terms Zebra does contending with whatever the race day Gods toss her way! 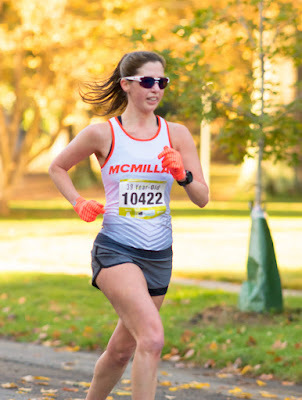 You actually ran a pretty nice race in my opinion, not your Coach, but I think you did really well irrespective of the "PR-Goal" you initially had. In fact...I commend you with how you find positive aspects to continue race and find another lessor goal that translates into success! Reasons? Could be many, but trust me the nausea at end of race is not anything GI-related...simply you pushing limits to the max that last mile and sprint to finish that can leave a runner body wanting to heave and nothing to heave out! To me...despite you not running to target goal and some references to "bonk" (but I don't see it that way)...simply think you kept it up hard in the end and ran your fastest metric distance to finish line and that can initiate feeling of nausea and dry heaves! It means you gave it your best, because this is how I viewed running your best in my past performances....you puke your guts out crossing the line! It's natural phenom...when you give it your all out best...or that is how I see it! 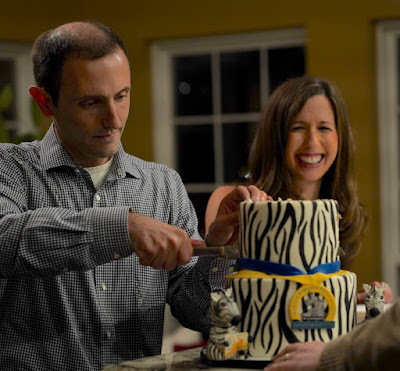 Doesn't matter...you have Greg has a zebra cake with little decorative zebras holding Boston-Bound booklets in their fore leg paws. 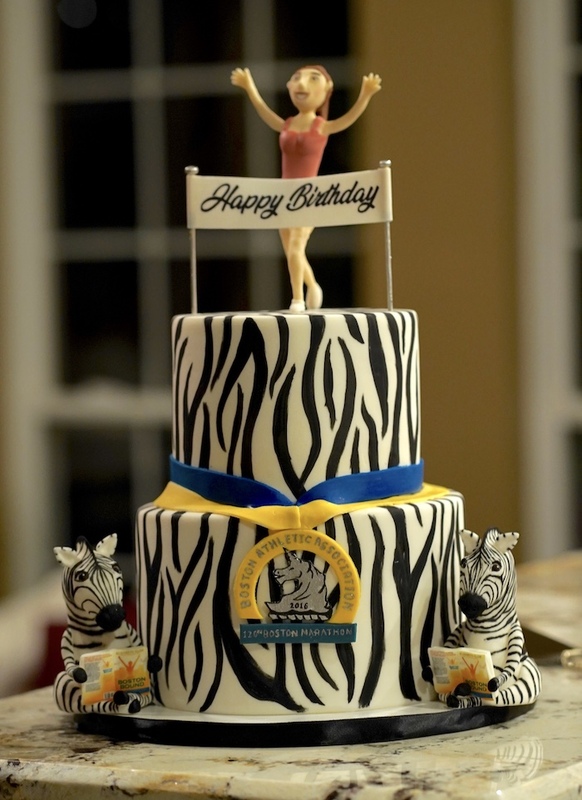 What could be so more awesome than a PR than a man gives you that BD cake zebra-themed with the Boston-Bound booklets? That my awesome run-friend is perhaps the greatest gift and greatest result of the race you ran! But I know that PR is what drive you...but as you go into the 40 age category...I simply suggest give it your best...be happy with whatever the Run-Gods let you run and just be happy you can run...whether it be like a Cheetah, a Tiger, or other fastie beast...just be the Zebra you were and are and will always be! It's not about what the outcome of your races that I follow...it is simply your passion and drive to be your best. And ultimately from your early roots...it is the part of you always had...simply the fuel to make you Boston-Bound and Found/Discovered. Praise to you...the person you be! You make some really good points. I really appreciate the point about dry-heaving and feeling nauseous NOT being related to digestive issues because I would hate to have to completely revamp my nutritional plan. And you're right- it's not like I had stomach cramping. Thanks for reading and for all your thoughtful words. I agree that having Greg is the best, and of course those zebras reading my book! I mean, I think the most important and best part of this entire post is that CAKE. OMG wow!!! I love it. Very cute of Greg. I'm turning 40. Here are my thoughts.